The S&P 500 ended the first quarter on a high note, rising 13.07% for its best quarterly performance in a decade. This was in sharp contrast to Q4’s dismal performance. The reversal in attitude was driven almost entirely by the Fed, who has dialed down both its policies and language considerably since October. The central bank did so again last week when it signaled that it would not undertake any rate hikes in 2019, which has now pushed the Fed’s bias all the way into the dovish column. The market managed to climb through the quarter’s final week, and with only the final estimate for U.S. Q4 2018 GDP and February housing starts to speak of, the Dow managed to rally into Friday’s close. Bad weather and a shortage of land and labor led to fewer groundbreakings in February. Housing starts fell -8.70% to a seasonally adjusted annual rate of 1.162 million units last month. Single-family homes in particular weighed on homebuilding, falling -17% to a rate of 805,000. While these were poor readings, they were explainable, and there are some optimistic points to be considered along with it. First, building permits for the month were 1.296 million units, outpacing housing starts which suggests a pickup in homebuilding in the months ahead. Another big positive for the housing market is the drop in mortgage rates. The 30-year mortgage rate fell from a recent peak of 4.94% in November 2018 to 4.06% through Friday. This week alone the benchmark, 30-year mortgage declined 27 basis points, according to Bankrate.com. This is the biggest decline in a decade, which will boost homebuyer affordability as well as act like a psychological catalyst. The final revision to Q4 showed GDP rising 2.20%, down from the previous estimate of 2.60%. Downward revisions to consumer and government spending as well as nonresidential fixed investment managed to steal from the first estimate of Q4 2018 GDP. On a positive note, despite continuing tensions between the U.S. and its global trading partners, exports were revised higher to 1.80% from a previously reported 1.60%. With uncertainty over trade continuing and the federal government’s shutdown early in the first quarter which crimped consumer spending, economists are currently penciling in Q1 2019 GDP growth of 1.50%. Although this is far below the fourth quarter’s growth, the first quarter has traditionally been a poorer quarter in general and it is reasonable to expect that we should be able to achieve 2.00% for the year, which has become the U.S. economy’s new normal. As we close the quarter, the equity and bond markets are telling different stories. On the one hand, you have stocks rallying on the notion that low growth with an accommodative Fed is simply a return to the pattern we’ve seen over the last decade – one in which inflation remains subdued and top line growth can be leveraged to produce reasonable returns on equity. The bond market, for its part, has its doubts. The benchmark 10-year rate had declined to 2.42% from 3.24% in November 2018 despite no change in the actual Fed Funds rate. We’re seeing some inversion occurring in maturities on the short-end of the yield curve (from 1 month all the way to the 3 year), but the traditional, recession canary – the two and ten year – fortunately remain upwardly sloped. In many ways, the dreary outlook from a perennially pessimistic bond market juxtaposed against that of an optimistic equity market feels right given the data we saw this quarter. Things are definitely slowing globally and central banks are responding by signaling they will be supportive by keeping rates low. This has been a magic formula in the past – keeping things neither too hot nor too cold – and with the U.S. economy being better positioned relative to other economies, equity investors are betting we will return to a Goldilocks economy once again. Traders will be paying close attention to March nonfarm payrolls, looking for a strong rebound in jobs growth after February’s weak gains. Also on tap, numbers on manufacturing and retail sales. When our advisors meet with clients to discuss retirement planning, they often mention “accumulation phase” and “distribution phase” to categorize important life stages relevant to making wise decisions about clients’ financial lives and assets. The accumulation phase refers to when an individual enters the workforce and begins earning money. 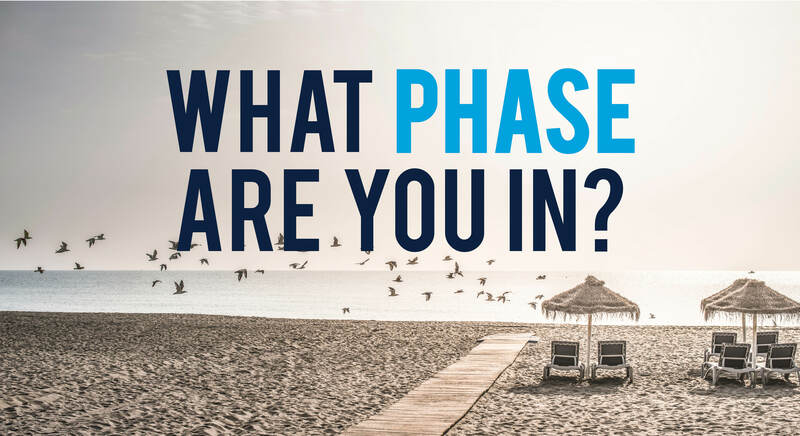 Advisors describe this phase as the time in our lives when we should be building wealth to provide a future source of income that can be accessed when we retire. During this phase, individuals should be saving as much as they can, as soon as they can. The number one rule of personal finance applies particularly strongly here: spend less than you make. This provides investors with the opportunity to benefit from the power of compounding and ensures investors and savers are setting aside critical funds for their future retirement years. We also tell individuals to “pay yourself first,” which means that before allocating income to expenses, you should first make contributions to any retirement savings vehicles you have, such as a 401k, IRA, emergency fund, or other long-term savings goals. Whatever money is left after you pay yourself is what you have available to spend and cover expenses. If you are currently in the accumulation phase of your life, the most important thing that you need to do is create a financial plan that is tied to your retirement goals. Retirement may seem so far out in the future that it may be nearly impossible to comprehend what your expenses and income needs will be. However, an advisor can help you contemplate what your future retirement might or could look like and discuss investment strategies to help get you there. Our advisors tell clients to not only invest early, but also to make sure that you are properly allocated based on your goals, time horizon, and risk tolerance. All of these are critical factors to ensuring a secure retirement. 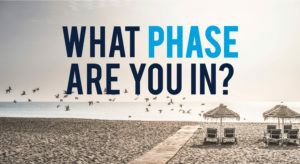 The distribution phase sets in when you reach retirement and begin collecting money or distributions from the retirement savings sources you established during the accumulation phase of your life. It is also called the spending phase, and some advisors might characterize the spending phase as the time in our lives where we get to enjoy the fruits of our labor. All the years of working hard and saving should be paying off. For most individuals, retirement income is generally lower than the income previously earned during our working years, and the tolerance for asset fluctuations is generally lower so there is a corresponding shift in risk from a more aggressive risk profile to a more conservative one. Preserving your portfolio and managing risk are important for ensuring your money will last through retirement. If you have any questions about your retirement plan or if you would like to meet with one of our advisors for a retirement readiness checkup, please do not hesitate to call our office at (214) 891-8131.